Intimidation and violent attacks on journalists are no rarity in South Sudan. But there are still brave men and women who, despite threats, defend freedom of opinion and of the press. One of these is Josephine Achiro Fortelo. She is a radio journalist and project coordinator of the Cross Border Network (CBN), a radio project of DW Academy. She mediates between 22 radio stations in Uganda and South Sudan, and supports the peace process by supplying independent information. On December 2, Achiro Fortelo received the Johann Phillip Palm Award for her outstanding commitment to freedom of opinion and freedom of the press. Previous prize-winners include Seyran Ates, the German-Turkish women's rights activist who founded the first liberal mosque in Berlin; Alaa Al-Aswani, the Egyptian writer who touched on many taboos in Egyptian society with her novel The Yacoubian Building; and Christian Führer, the former pastor of St Nicholas Church, Leipzig, where protests erupted in the 1980s against the East German regime. Deutsche Welle: You were just awarded the Palm Freedom of Opinion prize. How significant is the prize in terms of your work? Josephine Achiro Fortelo: The prize means a lot to me and the media in South Sudan. It's a reminder of the responsibility we have as journalists, because the prize came as a result of what we are doing as journalists in South Sudan. It will remind me of the duties I have as a journalist to serve my people and provide them with the information they need that will save lives in South Sudan. While you have tended to work as a journalist, you have shifted to media training and management. How does this help your cause? I like it because I work with the community. That is the most important part of it to me because I mostly deal with citizen journalists. Citizen journalists are part of the communities. They can be teachers; they can be farmers or community leaders. I give them the ABC of journalism so that they feed the community radio we have in our communities with the information they need. South Sudan is a very complex state. Mobility is one of the problems. Journalists don't have access to all the angles [nationwide] at the level of their community. They cannot reach anywhere. So we believe in helping citizen journalists get information from wherever the signal reaches. I love working with the community, for my people. What are the topics South Sudanese people want to be informed about on the radio? In general and in the media, we are in the nation-building process. We talk a lot about peace and peace building, conflict resolution and peaceful coexistence. This is a topic we try to focus on. Though we also have other things, like agriculture. We import everything we consume in South Sudan, so we are supposed to talk about that. [But] we need to have a peaceful environment to do it. How does your radio network deal with the problem of illiteracy and the multitude of local languages in South Sudan? I talk to people in South Sudan who don't know how to read and write with the help of a translator who can translate what I say into their local languages. The original idea was one radio station covering the whole country, but the question of language became a big discussion. How could you reach people in states where English and Arabic aren't spoken languages? So we have eight radio stations in the country now [and] every station broadcasts in the language of their community. 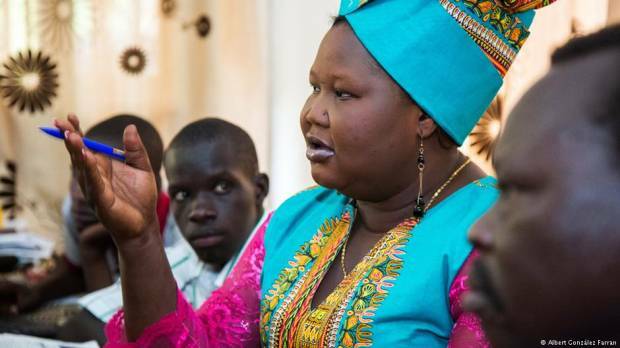 In South Sudan, a lot of journalists get threatened or even killed. How does that affect your work? I really thank God that some of us are still alive today. Our hearts are with our colleagues who lost their lives in the process of serving the nation as journalists. South Sudan is not a friendly country for the media, but we still need to inform our people. I tried to tell our leaders that it is a good thing to get feedback from the people, because they know what is going on. They remind you if something is going wrong. Since the signing of the peace agreement and the establishment of media authority, we have not heard of any arrests of journalists. But they can still harass you, or remove articles before printing. Those things are still there, but not like before. We don't say that people don't get killed, only the style of killing is now different. We have something called "unknown gunmen" in South Sudan. It is very difficult to identify whether the murder of a journalist was a targeted killing. How does it feel to be under constant threat? I was once thinking about leaving the country. But then I convinced myself that if everyone fled the country, who would work towards changing the situation? If I leave the country, who is there to do it? I'm not alone. We are many. I have colleagues and we have a lot of people working in the media. We believe that one day [these] things will come to an end. What part do journalists and radio play in the process of peacemaking? On the radio we read out articles one by one to our audience to make them understand what was agreed upon during the peace process, and what is needed from citizens to contribute. Some of the communities in South Sudan believe that they cannot live together. So one thing we do is try to maintain the process of peaceful coexistence. We want our communities to live together. What is your wish for the future of your country? My wish is to see South Sudan like any other country. We need citizens who love their country. Let's build up our country together. We have a lot of refugees in Uganda, Kenya and Congo who need to come back. I have a strong belief that we can make South Sudan a better state for all of us to live in. We need to believe in ourselves. Peace is the only option.